The Maldives is an island nation that consists of 1,200 islands. They sit at 5 feet above sea level, and they are disappearing. Located between the Indian Ocean and Arabian Sea, the disappearance of the Maldives might be mistaken for a freak occurrence of nature. It’s the kind of story you might see on History Channel about a nation that disappeared thousands of years ago because of a volcano or earthquake. Yet the Maldives are not Pompeii. They are not an isolated incident. They are the canary in the coal mine. One-fifth of the 12,000-strong nation of Tuvalu has already fled to New Zealand due to climate change. Kiribati is also disappearing. Officials of island nations like the Maldives, Kiribati and Tuvalu have been sounding the alarm since the 1980s. While larger nations may argue whether climate change even exists, these nations suffer the direct impact of it every day. Unfortunately, island nations hold little prestige in the international community. 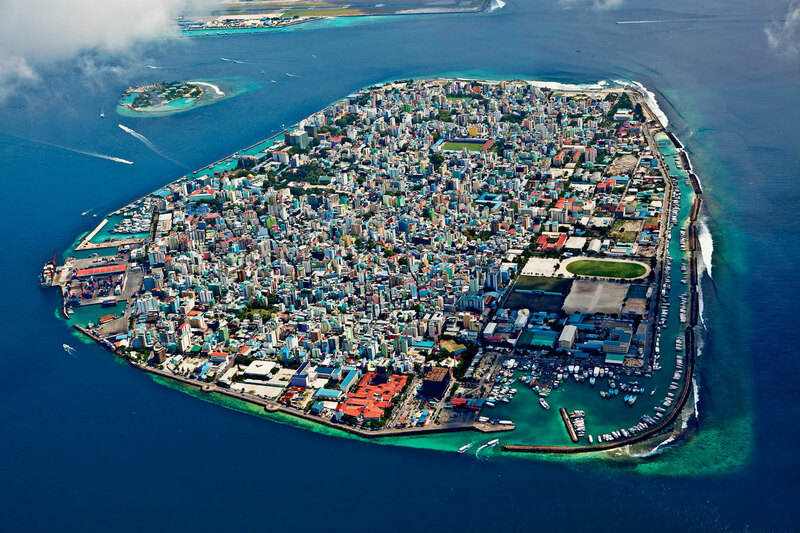 While Maldives as a nation has started building artificial islands that can adjust to rising sea levels, international law fails to recognize these islands as territory, or those who flee sunken territory as refugees. If you haven’t heard of those places, you’ve probably heard of Bangkok, Thailand. The Southeast Asian country’s capital is being engulfed by water. It may have less than 15 years left, as we know it. If the world cannot handle five million Syrian refugees of war, how will it handle 150 million Bangladeshi and Indian refugees whose land is underwater? How will Vietnam feed itself with the disappearance of its agriculture along the Mekong Delta? What will happen in West Africa when 14 million subsistence farmers can no longer feed themselves? The British government’s Stern Review on the Economics of Climate Change predicts 200 million climate refugees in the next 35 years alone. Much was made of a recent study that found East Antarctica is gaining ice at a faster rate than West Antarctica is losing it. This prolongs the melting of the Antarctic ice sheet by 20-to-30 years, until the loss catches up with the gain again. The West Antarctic ice sheet will still disappear within the next few years, continuing to cause ecological disaster. Surprisingly, this ultimately makes little difference in climate change models and the disappearance of nations. Why? The melting of Antarctica was never the core problem to begin with. Greenland is. According to Dr. Robert Grumbine of NOAA’s sea ice group, all the world’s sea ice could melt and contribute only 4 millimeters of global sea level rise. This may happen as soon as 2030, when the Arctic may experience an ice-free summer for the first time in 6,000 years. Add in Antarctica, and sea levels may rise anywhere from 2.5 to 6.5 feet by the year 2100. Cities like New York, Houston, Miami, and New Orleans would become unlivable. Yet a complete meltdown of the Greenland ice sheet could increase that estimate by 20 feet. No coastal city would remain intact. How is the Greenland ice sheet doing? It is melting faster than most climate models anticipated. Due to the lack of sea ice over the North Pole during summer months, sunlight isn’t reflected back by bright, white ice. Instead, it warms the dark water of the ocean, creating a cyclical warming pattern that changes weather and melts the Greenland ice sheet even faster. And the Maldives? They held a meeting of their government underwater, wearing scuba gear, just to get attention from the international world. Yet there’s still very little attention being paid to a burgeoning problem. Do you think the international community is addressing climate change quickly enough? Can these nations be saved?